Our market is full of rejuvenate-skin-care products. Mostly natural, as it should be these days. Propolis is a product which comes from antiquity and today it has scientifically proven itself to be one of the best in treating skin diseases and beautifying our complexion. Cosmetics has embraced it and now is heavily using it. 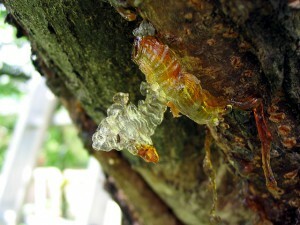 Coming from the bark of trees, propolis is basically made of tree resin. The word propolis comes from Greek: “pro” = in front, “polis” = city. Which is “in front of the city”. The word makes us imagine soldiers or a protective shield. It is used to fill the cracks and secure the nest. A glue, just like it is also called: The bee glue. History tells us about its uses, people have always used it due to its antimicrobial and antiinflammatory properties. 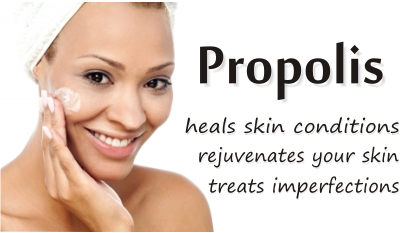 Today research has shown very good results in using propolis to treat many types of skin conditions. Studies have showed the efficiency of propolis against epidermophytosis, skin tuberculosis alopecia, psoriasis, different microbial and chronic eczemas, cutaneous conditions of cold regions, pyoderma, Trichophyton skin inflammation, burns. Propolis was applied as: 10-50 % propolis ointments or creams, 10-20 % propolis water tinctures, propylene glycol containing 3.6 % propolis, or even ethanol tincture – on old wounds that supported alcohol application. •Forms of bee propolis: ointment, pills, essence, spray, syrup, toothpaste and….? There were very good results in using propolis against cold sores, Herpes simplex skin lesions and Herpes zoster lesions, genital herpes. Egyptian propolis was successfully used against different types of warts. According to Potschinkova, propolis-beeswax warming plasters can be used for the treatment of arthritis and arthrosis and against sprains, physical injuries, inflammations of muscles, nerves and filaments. Propolis ointments are also used for these conditions. Please be careful when applying propolis externally. Before application, do a test for propolis contact allergy. Because propolis is antibacterial, antifungal, anti-viral, anti-acne, anti-inflamatory, antioxidant, epithelial, micro-circulation and has topical anaesthetic effects. It has low toxicity and good skin compatablity, despite the risk for allergic reactions. For skin lotions and cosmetic creams, 1-2 % propolis seems to be the appropiate amount. Coming back to Egyptian propolis, there is a very good formula of skin cream, Egyptian Magic, made of almost all products of the hive: beeswax, honey, bee pollen, royal jelly, propolis extract and olive oil. 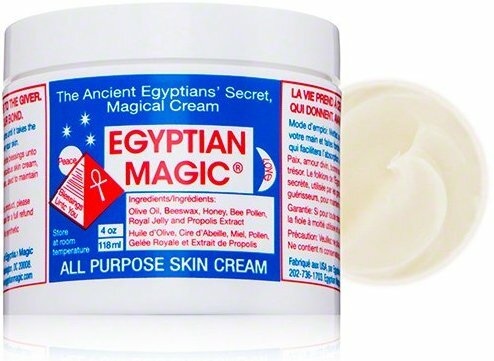 I’m not sure if I’ll buy this cream, but people say it’s miraculous and that it was secretly used by the great sages, mystics, magicians and healers of ancient Kamit (ancient Egypt). It is used as an anti-aging skin rejuvenation to maintain radiant, healthy, smooth and glowing skin. • Propolis protects liver, has anti-radiation effect, boosts immunity and has anti-inflamatory activity. • In a study published by hindawi.com, conducted in 2013 at a burn clinic in Brazil, the effect of Brazilian propolis skin cream was compared with that of silver sulfadiazene (SSD) in the treatment of minor burns (superficial second degree) in the ambulatory care setting (less than 20% total body surface area burned). Patients were admitted to the study only if their initial presentation for burn care was within 48 hours post-injury and if bilateral wounds of similar depth and quality were present. Patients had propolis skin cream applied to one wound and SSD applied to the other selected wound on initial presentation and underwent debridement and dressings change the following morning. Patients subsequently returned to the clinic every 3 days to have the wounds checked and dressings changed. At these check-ups, wounds were cultured for microbial growth and photographed to document inflammation and cicatrisation. Patients were instructed not to disturb their wounds or change their dressings at home, thus propolis skin cream and SSD were applied to the wounds only at the specified 3-day intervals. The results do not show any significant difference in microbial colonization between wounds treated with SSD and propolis skin cream. However, wounds treated with propolis skin cream consistently showed less inflammation and more rapid cicatrisation then those treated with SSD. 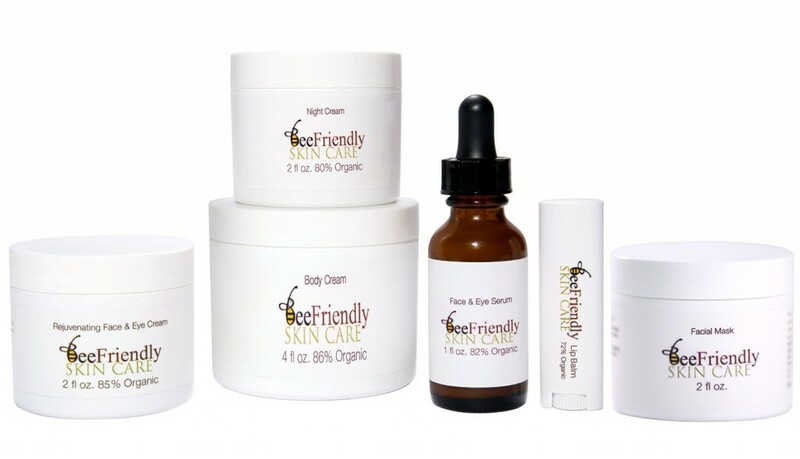 It is concluded that propolis skin cream appears to have a beneficial effects on the healing of partial thickness burn wounds. More frequent application of propolis should enhance the antimicrobial and wound healing effects of propolis. Antimicrobial Brazilian propolis (EPP-AF) containing Biocellulose Membranes is a promising biomaterial for skin wound healing. • Asavova reviewed Eastern European studies: propolis was successful in treating ulcers; burns, healing of damages due to cancer radiation treatments, badly healing wounds. It was also used for the treatment of surgical diseases wounds and burns. In Cuba a better success was achieved by mixing honey, propolis and thyme oil. • Barbosa reviewed other studies on the successful use of propolis in skin lesions such as ischemic ulcer, stasis ulcer, venous ulcer, iatrogenic lesion and ulcer, using a 30 % aqueous propolis extract. Good effects were seen after the first week of treatment. According to the authors of this study, wound healing efficacy is closely associated with the propolis concentration in the solution. • Another study, which used propolis ointment on 22 chronic wounds (11 were venous ulcers, 7 pressure ulcers, 2 diabetic ulcers, and 2 post-trauma injuries), found that necrotic tissue was present in 14 (8.2%) during tissue assessment process. After the treatment was no necrotic tissue. Healing time was 13.2 weeks. 74.1% of ulcers had healed before a 20-weeks follow-up. All patients with chronic wounds, complaining about pain, reported improvement, though the level of felt pain could not be measured. Do note the long time necessary to heal, natural products always work by stimulating the body to treat itself, not by a forced external healing. • In the Russian centre for the treatment of burns they used 15% propolis in animal fat or plant oils. The propolis ointment had a anaesthetic, bactericidal and wound regeneration effect, improving also blood and lymphatic systen. Recently the Russian preparation Propolis Geliant, based on a propolis containing mixture with sunflower oil and heavy fractions of a dark natural wax is successfully used for the treatment of burns, wounds, skin diseases and in cosmetics. • Hartiwich et al. tested propolis treatments on patients operated for goitre, patients with wounds and ulcerations difficult to heal and patients with non-specific rectal inflammation. They also tested the effectiveness of propolis as supplementary means in eradicating treatment of Helicobacter pylori. It was found that the drug was tolerated very well, practically had no side-effects and was highly effective. • In a study with Bacharis propolis, and published by pubmed it was found that optimum results for treating wounds can be achieved by propylene glycol containing 3.6 % propolis. At this concentration all tested bacteria could be inhibited. Application forms: propolis ointments or creams, 10-20 % water or glycol propolis tinctures. Best Face and Eye Moisturizer – Rejuvenating face and eye cream. minor burns. Journal of Alternative and Complementary Medicine 8 (1): 77-83. KUMAZAWA, S; NAKAMURA, J; MURASE, M; MIYAGAWA, M; AHN, M R; FUKUMOTO, S (2008) Plant origin of Okinawan propolis: honeybee behavior observation and phytochemical analysis 67. Naturwissenschaften 95 (8): 781-786. Propolis treats otorhinolaryngologic and respiratory diseases Acacia honey is made of false acacia! 🙂 That’s a good one.